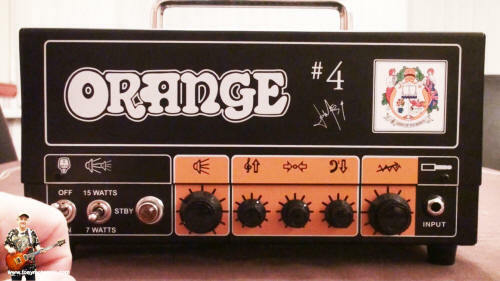 The Orange Jim Root #4 terror amplifier is built down to a price. Made in the Far East can this small amp cut the mustard? The Jim Root #4 Terror (not so tiny!) offers a big fat load of tone for little money for sure. But sometimes looks can be deceiving and you can end up with an amplifier that can fry others and send them to hell for a fraction of the cost of some of the alternatives. While this amplifier really is a budget amp the fact is that it has sold in many thousands (or even tens of thousands) and is a successful amplifier if only judged by its sales. So what exactly makes this amp any different to all the other amps in this highly contested cost area and how exactly does it shape up to getting real tome from it? Can it really be any good or is Orange marketing clouding the views of buyers. Let's face it, it would not be the first time I have bought an amplifier on the basis of marketing and later found out that in reality it was just a shadow of what the manufacturers said it was. But maybe this time? Somehow we guitarists always have 'faith' that the next amp will be the one right? Well I'm here to tell you the truth about the Orange Terror in all it's glory; the good, the bad, the stuff you wish you knew before you bought it. That way you might just be saved from being in heaven or hell depending on your wants from this amp. Read on to find out exactly what this amp is like and whether you should be buying one right now! This review is currently being written so watch for the updates soon and check my news page regularly.